Did Trump Commit a Crime in Sharing Intelligence With Moscow? The idea that these leaks to the Post by “current and former U.S. officials” are in the service of US national security interests strains credulity. They manifestly are not. Until quite recently, cold warriors within the Trump administration and the American foreign-policy establishment had the wind at their backs. President Trump’s appointment of hard-liners such as former generals James Mattis and H.R. McMaster, along with the selection of neocon Russia hawk Nikki Haley to be ambassador to the UN, were early signs that the president was simply not serious about improving US-Russian relations. Trump’s decision to bomb Russia’s ally Syria last month seemed to put the prospects for détente out of reach. Yet something funny happened on the way to Cold War II. 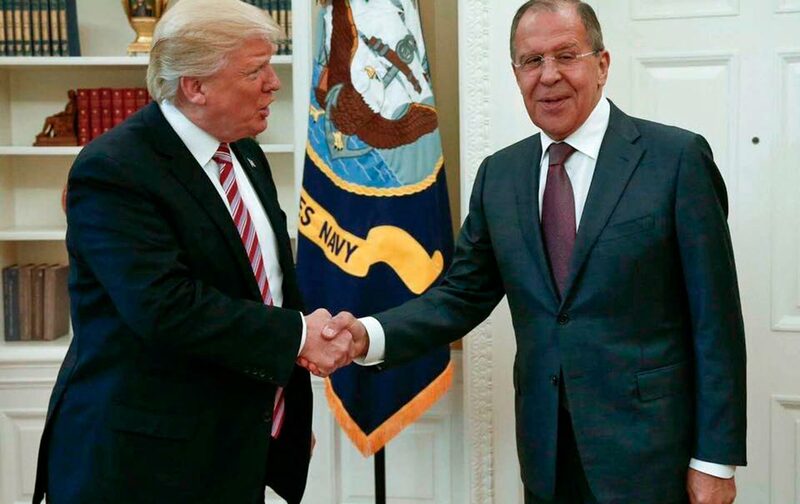 Trump, in what initially seemed like a wondrously tone-deaf move given the timing, met with Russian Foreign Minister Sergei Lavrov and Russian Ambassador Sergei Kislyak in the Oval Office the day after he unceremoniously fired FBI director James Comey. The Oval Office audience was enough to alarm hard-liners both inside and outside the administration. The meeting, combined with reports currently circulating that the fortunes of administration members like Haley, Mattis, and McMaster have fallen (while those of Secretary of State Rex Tillerson have risen), was enough to cause the new cold warriors of the US foreign-policy establishment to spring into action. By now, it should be relatively uncontroversial to observe that Trump is a loose cannon and an embarrassment. Yet the idea that these leaks to the Post by “current and former U.S. officials” are in the service of US national-security interests strains credulity. They manifestly are not. What they actually do is to serve the narrow agenda of the new cold warriors, undermining cooperation with Russia, thereby making diplomatic solutions more, not less, difficult to achieve in an ever-growing number of theaters (the Baltics, Ukraine, Syria, and perhaps soon Iran) in which the United States and Russia are currently eyeball to eyeball. Further, consider the pretzel logic these “current and former government officials” would have had to employ in order to justify leaking details of the Oval Office meeting to the Post. The leakers informed the Post that Trump shared with the Russians highly sensitive classified intelligence that came courtesy, as we now know, of the Israelis. The officials claimed they were concerned that if Israel (whose military and intelligence service are heavily subsidized by the American taxpayer) learned that Trump did this, they would be less inclined to share valuable intelligence with the United States in the future. So what do they do? They ensure that the Israelis find out about what Trump shared by leaking the details of the Oval Office meeting to the Post. All of this raises a rather pertinent question: Who are these officials and why were they so reckless with this information? It would be hard not to conclude that their wish to sabotage Trump outweighed their purported concern over potentially losing a valuable source of intelligence. That the Israelis would have reacted in such a way is certainly arguable. After all, over the past several years, Bibi Netanyahu has cultivated a close relationship with the Russian president. The Russians and the Israelis presumably have a robust channel of military and intelligence sharing: Is it reasonable to assume—as these unnamed leakers surely did—that Israel would cut off intelligence sharing with the United States if it knew (as it now does) Trump shared classified Israeli intelligence with the Russians? No. The motive of the Post’s anonymous leakers may be easily explicable: to kill Trump—and by extension détente—by a thousand leaks. The reaction to the story was nothing if not predictable, providing ever more examples (as if more were needed) of the newfound reverence Democratic operatives and activists have for the US intelligence agencies. Yet, whatever one thinks of Putin’s Russia (and there are serious, substantive disagreements on both the right and the left sides of the political spectrum), it should be relatively uncontroversial to observe that a return to Cold War levels of antagonism between the world’s two leading nuclear (and conventional) superpowers poses a significant threat to the prospects for a more peaceful world. In that case, Trump’s willingness to stand up to what President Obama derisively called “the Blob” of Washington foreign-policy group-think and pursue cooperation with the Russians in the fight against Salafist terror should be cause for optimism, not occasion for expressions of faux-outrage by the likes of Professor Dershowitz.